An old dam on the Eklutna River has blocked salmon runs there for decades. Now, an Alaska Native tribe wants to tear the dam down and restore fish to the river. It stands in a canyon 400 feet deep, a mile or so off the Glenn Highway, but hidden from the view of passing motorists. The old Eklutna Dam was built in 1929, to divert Eklutna River water for Anchorage hydroelectric power. It operated for only thirty years, before Eklutna Lake water, the source of the river, was diverted elsewhere for another hydro project. For half a century, the dam has been obsolete, as far as power is concerned, but it is still blocking salmon runs. Brad Meiklejohn is the Alaska director for the Conservation Fund. He says the idea was inspired by the 2014 documentary film, “Dam Nation.” Micklejohn says the old dam has to go, so that salmon runs can be restored to the the river. 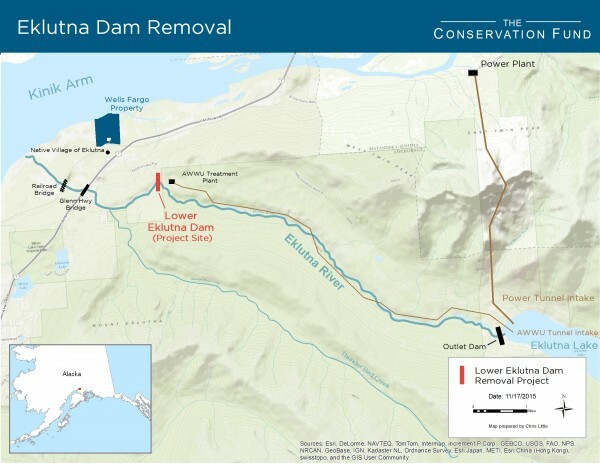 The Conservation Fund has pledged to pay the cost of the project,and the local Alaska Native corporation, Ekluna, Inc., is on board with the plan. Curtis McQueen, CEO of Eklutna Inc, says it’s been a dream of his for years to see the dam removed. He says it will “lift the spirit of the village,” and that spirit is intertwined with salmon. But over the decades, railroad and highway projects have altered the river bed radically, essentially devastating the lower river near the village. A U.S. Army Corps of Engineers study done [2011 -2012] a couple of years ago confirmed the problem, but indicated mitigation is possible. McQueen says pools could be created in the riverbed for salmon fry to hide in, or riverbank restoration projects could provide protection for small fish. But a greater problem needs to be addressed, he says. Since regular maintenance on the dam ceased decades ago, debris, boulders and silt have built up behind it. That will have to be removed, but Brad Mieklejohn says taking the old dam out is the easier of the two-part plan. The second part… the task of getting more water back into the Eklutna River…will be the “hard part,” he says. The Eklultna River is pretty much devoid of water these days, because a second dam at its headwaters at Eklutna Lake diverts water to the hydropower station on the Knik River, where the water is dumped into the Knik. Phil Steyer, spokesman for Chugach Electric, says his company as yet has no information on the plan, and cannot comment yet. McQueen says Eklutna has a good relationship with all three companies, and points out that MEA built its newest power facility on Eklutna land. Meilkejohn says those conversations have yet to take place. And he says no one knows how much water is needed to restore salmon habitat. At this time, McQueen says, Eklutna Inc is focusing on removal of the old dam. Work is scheduled to begin next year, and it is hoped the village will be celebrating the dam’s demise by 2018.